The Magnet Squirrel-Proof Feeder features four, weight-activated perches designed to support songbirds, but collapse under the weight of squirrels and large birds like doves, jays and starlings. Small independent magnetic perches release under weight exceeding 3 ounces (85grams). No batteries, no motors, no springs! Stainless steel locking washers prevent squirrels from prying open the aluminum lid. Holds up to 7-1/2 pounds of seed. Made in the USA. Feed thistle to your finches and goldfinches without squirrels pilfering the seed using the Brome Squirrel Buster Finch Feeder. This innovative feeder has a two year warranty against squirrel damage and offers a weight sensitive design crafted to deter larger animals without harming them. A metal mesh shroud surrounds the clear plastic seed tube, creating clinging areas for your birds. Perches at the four bottom ports offer a resting spot for birds, while the four upper ports are accessed by clinging onto the wire. When a larger animal, such as squirrel, lands on the feeder, the shroud lowers over the ports so they are not able to reach the seed. The design of the seed tube also features a ventilation system, which allows warm air and humidity to escape from holes at the top of the feeder, while fresh air enters through the seed ports. This keeps the thistle seed fresh, helping to attract more birds. The tube holds 2.1 pounds of thistle seed for a generous feeding station. A green, metal cap protects the seed from excess moisture and a wire hanger enables the unit to be hung from a bracket or branch. The "negative grip" cover on the hanger disallows squirrels from outsmarting the mechanism - they slip off rather than grabbing the hanging wire with their feet and reaching the seed with their front paws. Hang the feeder at least 16 inches away from a secure foothold for squirrels. Delight the finches in your area with this Squirrel Buster Finch Feeder. The Squirrel Buster Mini is guaranteed to be squirrel proof. Openings in the bottom of the metal mesh shroud are aligned with the seed tray and allow birds access to the seed. When a squirrel climbs onto the feeder, its weight automatically forces the shroud down, closing access to the seed tray. Squirrels are shut out but not harmed in any way. The negative grip tube is part of our patented technology. It prevents squirrels from grabbing the wire hanger with their hind legs, hanging down alongside the feeder, and defeating the closing mechanism. Both perching and clinging birds love this feeder. The seed ports have perches for the perching birds but the metal mesh shroud also offers a large clinging area. Because of the combined perching and clinging surfaces, you will find an enhanced level of bird activity with the Squirrel Buster Mini. 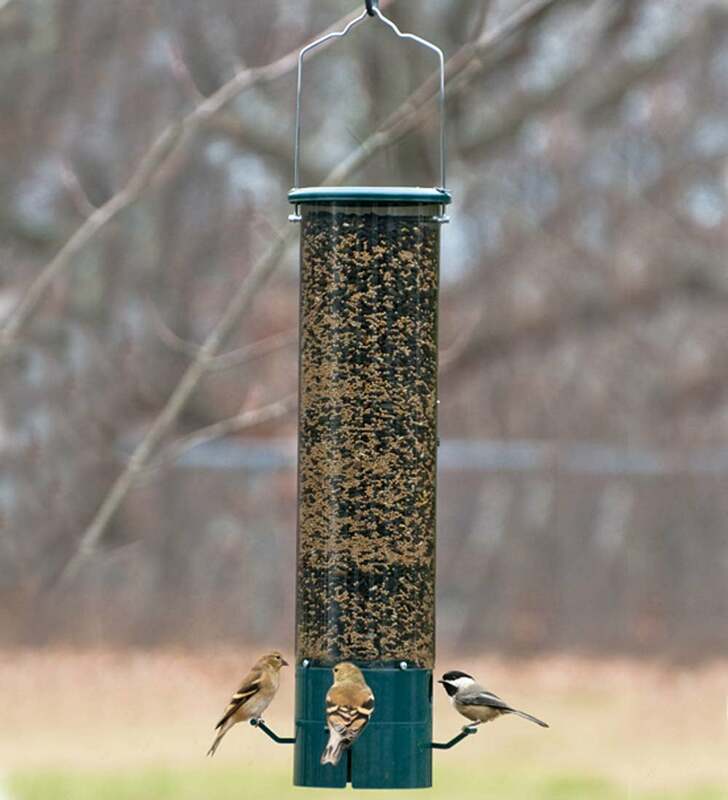 The feeder also features a patented Seed Tube Ventilation System to keep birds healthy. Transparent seed tubes are like greenhouses, they trap solar energy. Traditional seed tube cover designs block the escape of heated air. The patented Seed Tube Ventilation System in Squirrel Buster Mini permits humidity and hot air to escape through vents at the top of the feeder. The escaping hot air is replaced with fresh air entering the seed ports and openings on the bottom of the seed tube. The seed stays fresher and attracts more birds.